Several of you already have a plan down, and many of you are trying it out! As I prepared for dinner a couple of days ago, I thought I should share a few more tips on how we save $$$ on food. When you plan your meals a week, or two in my case, in advance, you will save money. You will have an accurate list of what you need from the store, so you won't waste money buying things you don't need in the immediate future. You will in turn go to the store less often, inevitably keeping the green in your purse. Also, you will eat out much less, because you will have a plan, and all you need in the cupboard to execute it. No more last minute trips for eating out just because you're hungry and there's "nothing to eat". Then, you can save the dining money for fun. Do you prep your meal ingredients ahead of time? Typically, I do. I already opened the door for you to peak into the witching hour at our house. I tell you, if it's all going to hit the fan, it hits it then. I've heard it's all hitting the fan at your houses then, too. So, what can we do to make it a little better? Get ready for battle! One big defense is to have your dinner stuff ready, so you can throw that meal together right quick. 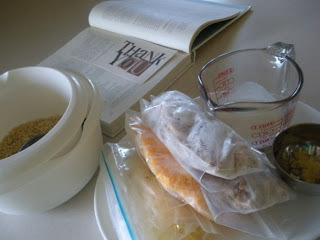 I prep my ingredients in the morning, after breakfast when the kids have free time to play downstairs. 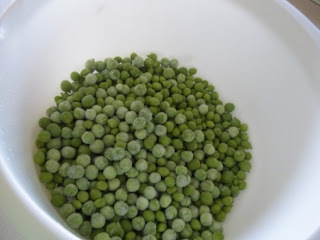 I listen to a podcast, or watch Today, and I mince and press and measure and defrost. On this morning, I prepped for Cheesy Chicken and Rice Casserole, which is I think on page 254 of my favorite weeknight cookbook. Let me check. Would you believe, I was right?! 254 it is! I digress. 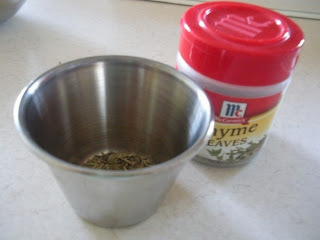 So, measure your stuff, put it in cute little containers and bowls, or ordinary ones, like mine. They can all go in the dishwasher when you're done with them that night. Here's a tip, buy chicken stock in bulk, or make your own, or even just when you get it on sale, and freeze it in nice amounts so it's easy and on hand. When you make a lot of meals with the 30 Minute Meals book, you'll use chicken broth a lot. 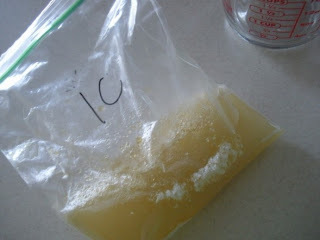 I freeze it in 1 C bags, and 2 C bags. That's almost always how much I need. Then, when I'm preppin' I just get it out to thaw. I do this with lots of things- see? First of all, there's my rice and cream and everything all measured and the frozen stuff is ready to thaw in the fridge all day. Oh, and for a nice pick-me-up, leave nice notes you've received from friends in your cookbook to help mark your page for that night. Then, you can read the nice note later, when you feel like screaming at your kids. Read. Don't scream. As for the chicken, I always use turkey in place of it in any recipe that needs cooked, cubed or shredded chicken. Twice a year, we buy a turkey when it's on sale- you can get great deals around Thanksgiving, like turkeys for $5! We make the turkey, have a roast turkey meal once, then take the meat from the turkey and cut it up and freeze it in bags with 2 C of meat in each. One turkey gives us about 15 meals of meat, for very little cost. Then, when I need one, I just pull it out- easy. Already cut up and everything. In case you're intimidated, I can't think of anything easier to make than a roast turkey or a chicken- preparing it to roast takes about 5 minutes, then you just leave it alone for a few hours and it's done. If you want to know more, email me. Also, there's a bag of pre-shredded cheese from my freezer. Cheese is much cheaper in a 5 lb package at Sams, then I use my food processor to shred it myself, then freeze it in bags of 2 C each, since that's usually how much I need. I actually then use my 25% less rule and no one notices. And we save 25% more on cheese. Now, for the tutorial. 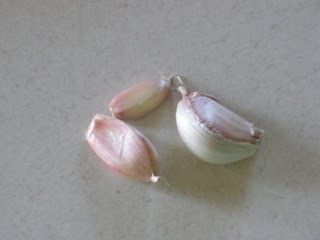 When I posted this recipe, three people asked me what exactly minced garlic was. There was a time when I didn't cook with fresh garlic either. My mother never used it. Now, I use it at least 4 times a week. We Kochs love garlic, right down to the H Man. 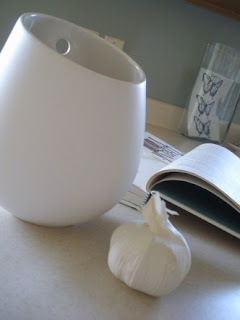 I keep my garlic in a container in the kitchen. It keeps for a long time, so you can keep it on hand for whenever you want it. Take it apart and get as many cloves as you need. 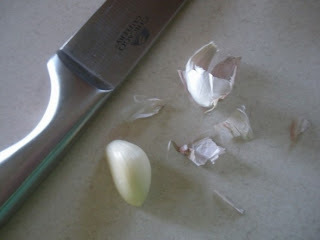 You'll need to peel them, unless you have a really nice garlic press. Usually if you just rub them in your hands, the outer layer will come loose, then remove it. If it doesn't, lay the broad side of a knife down on it and hit it and that should knock the peel loose. 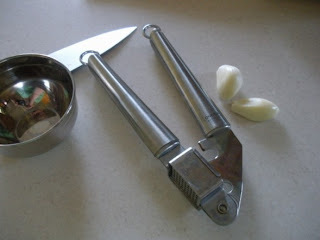 Get yourself a garlic press, if you don't have one. Experts like to just mince it with a chef's knife, but I don't have anything to prove. I use a press. Then, if you're preppin', just keep it in a cute little bowl until you need it that night. Love this idea! I need to do more prep work in the morning and thanks for the garlic tutorial! 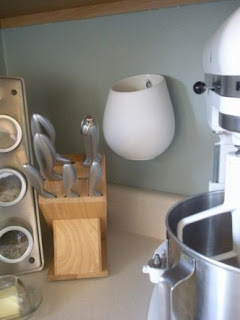 I have a list started of kitchen tools I need and a garlic press is one of them. When I get my new cookbook, I am so going to plan out a month or so worth of menus just so I don't have to think about it so much anymore! Thanks for all your tips! And really, 25% less cheese?! My husband would never let me get away with that! He makes me add 25% more! I'm totally a freezer fan! i thought i was organized!! food prep in the morning - u r amazing!! I absolutely love my freezer. I've convinced the hubby that we need an extra one for the garage once we have kiddos. Ours works great for two people, but with all that I freeze, we will need more space here soon! I'm intrigued by the roasting chicken/turkey idea. That is brilliant. Perhaps you would be willing you share your favorite recipe/method? These are some great ideas, but they force me to reveal my culinary ignorance. 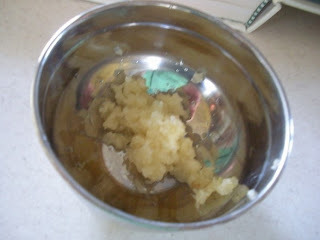 What is chicken stock? dang girl! I think you might have a sickness, HAHA. No, I'm totally kidding. I admire your organization, but I do well to remember to take out entire meals I've frozen, let alone ingredients. Go Megan, go megan, go! Hi There - I just wanted to say thanks for the 2 weekk meal-plan idea. We are loving it! I'm shopping for all the ingredients the first week, and then just getting produce, milk, eggs, (and the inevitable ingredients I forgot)the next week. It is working great! Without changing anything, we chopped like 25% off our grocery bill (is this part of your 25% rule??). I don't know how it happened, but we're spending less and still having enough for the two weeks. Thanks! I agree...it's so much easier to plan meals, and arrange the ingredients ahead of time! You are amazing... I keep saying it ...but...where were you all those years that I was teaching home economics?? we sound like twins now! I too prep, but usually late into the night as I have an outside of the home job as well., it is so much handier and cheaper to be organized. And the freezer is my best friend!! LOVE LOVE LOVE IT! 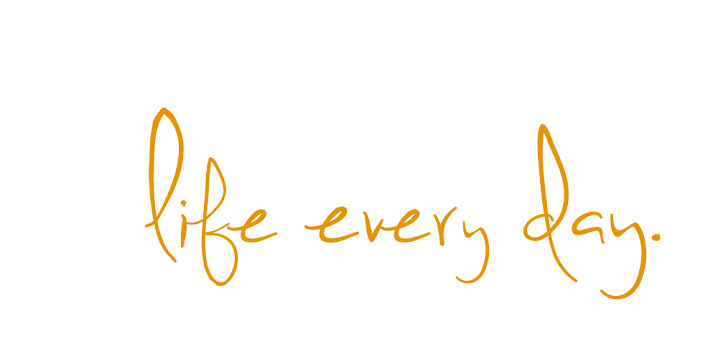 Thanks for all the tips...great to know others are living well!